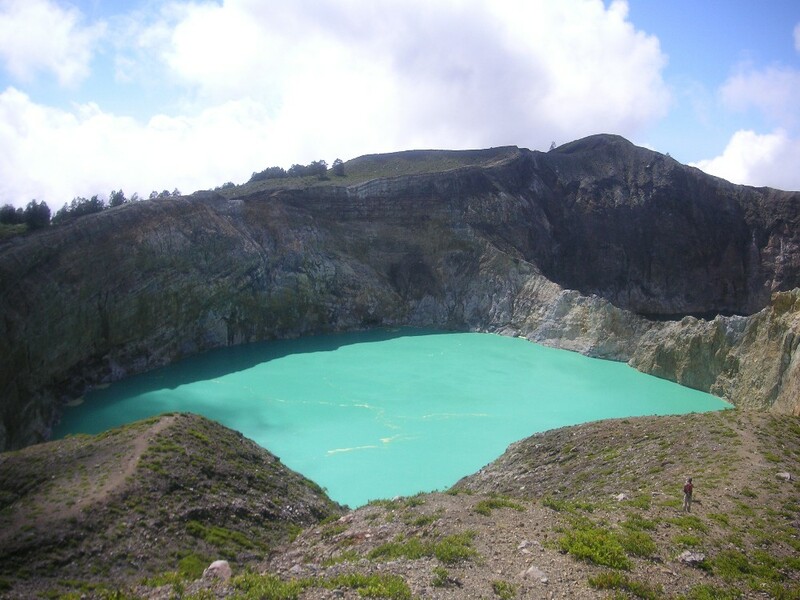 Famous for its three exotic coloured lakes, Kelimutu is the most famous natural tourist attraction on the island of Flores, apart from the staggering beauty of the whole island itself. 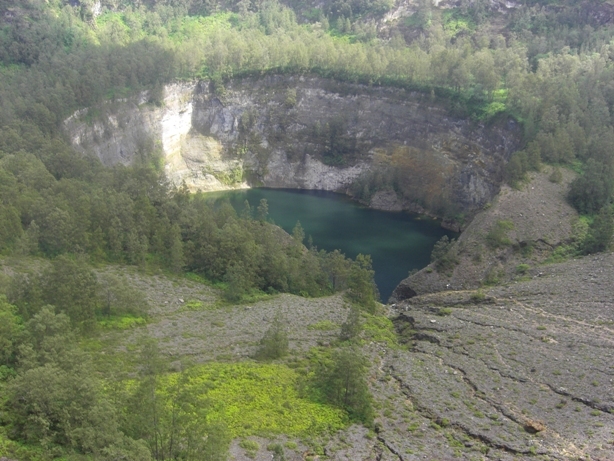 The Spesial place on Kelimutu is the so called “Inspiration Point”, which is the viewpoint from where you can see all three of the crater coloured lakes. 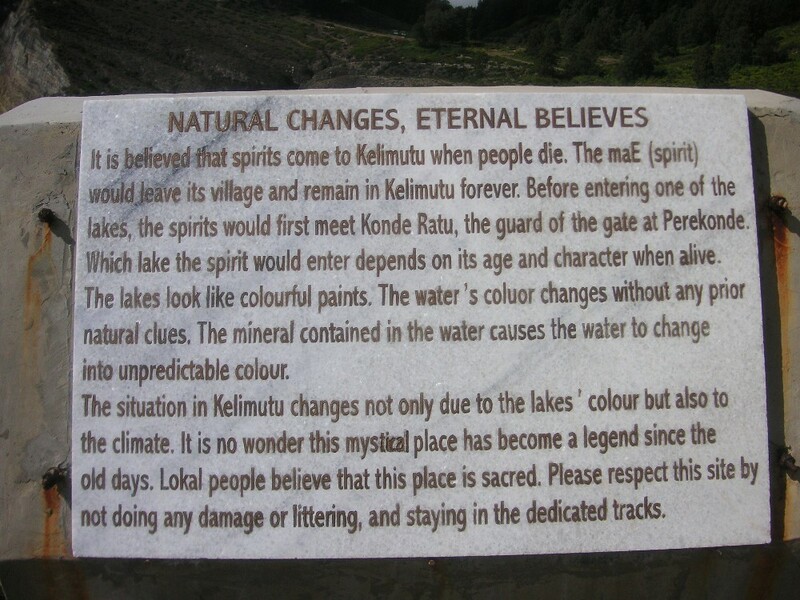 The lakes are Ata Bupu (brown, “Lake of Old People”), Ata Polo (red, “Enchanted Lake”) and Nuwa Muri (turquoise, “Lake of Young Men and Maidens”) although the colour of the lakes changes. 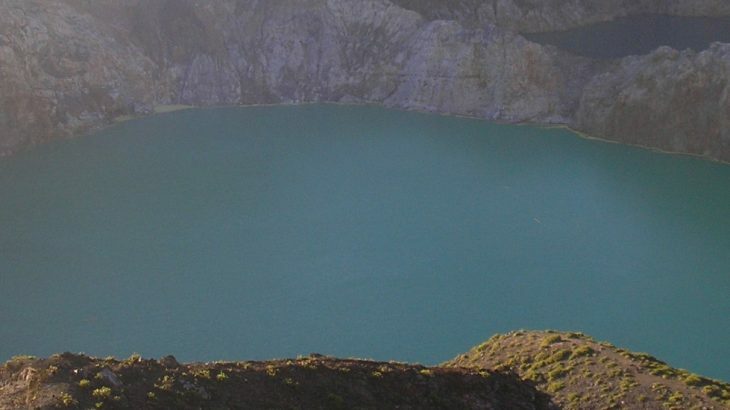 If like most people travelling through Flores you have a copy of the Lonely Planet guidebook, you will be expecting something very special from Kelimutu. 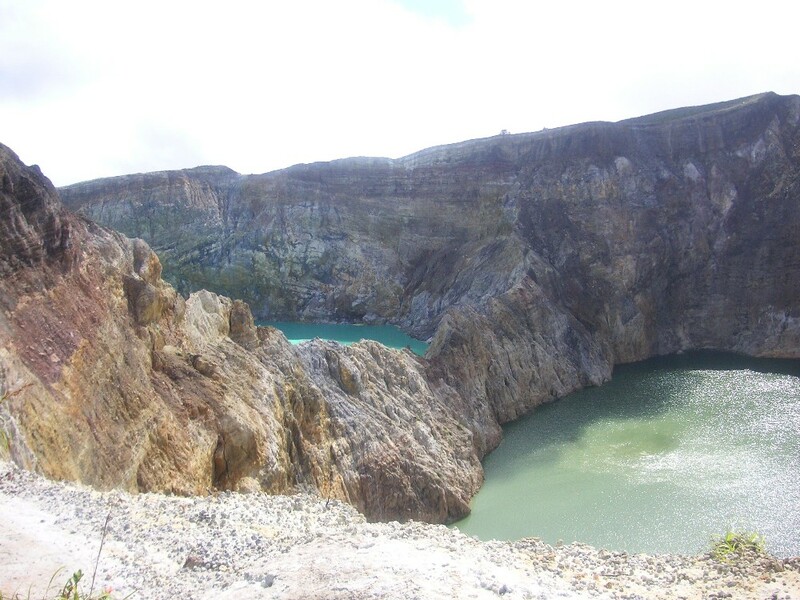 Unfortunately the Lonely Planet description of Kelimutu is wildly over-the-top and in our opinion Kelimutu is a worthwhile diversion on the Flores itinerary, but don’t set your expectations too high. 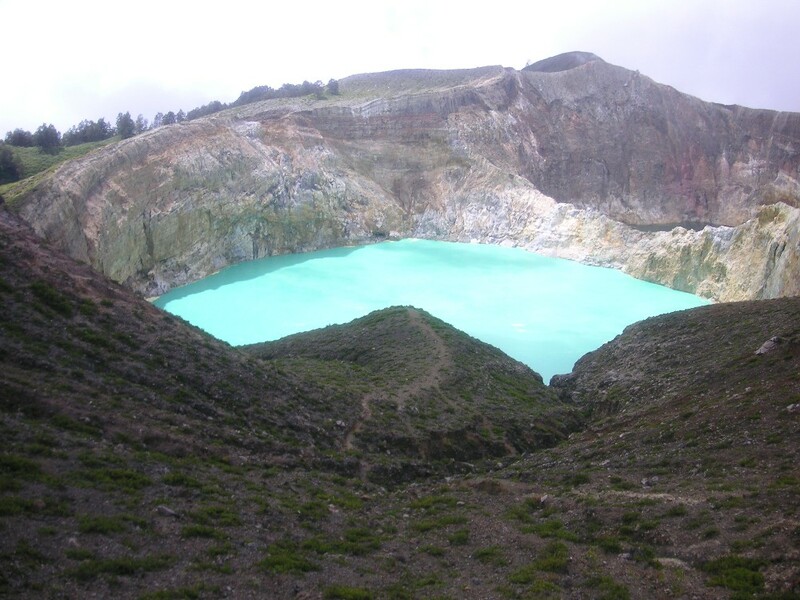 As a Spesial, Kelimutu does not come close as a natural attraction to Bromo or Papandayan in Java. 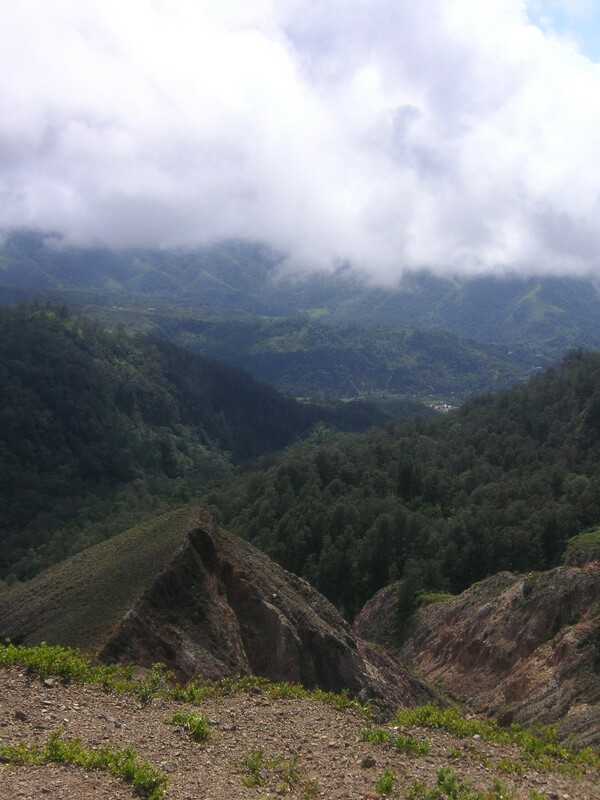 You should aim to visit Inspiration Point for sunrise, which means staying overnight in the pleasant village of Moni. Leave Moni at 4:30 am with your driver or a motorbike taxi (ojek) and you’ll be at the National Park gates when they open at 5 am; from there it’s a short drive to the carpark. From the carpark it is 20 minutes walk along a paved track following the signs to the “puncak” – as you walk the light should be building for sunrise. 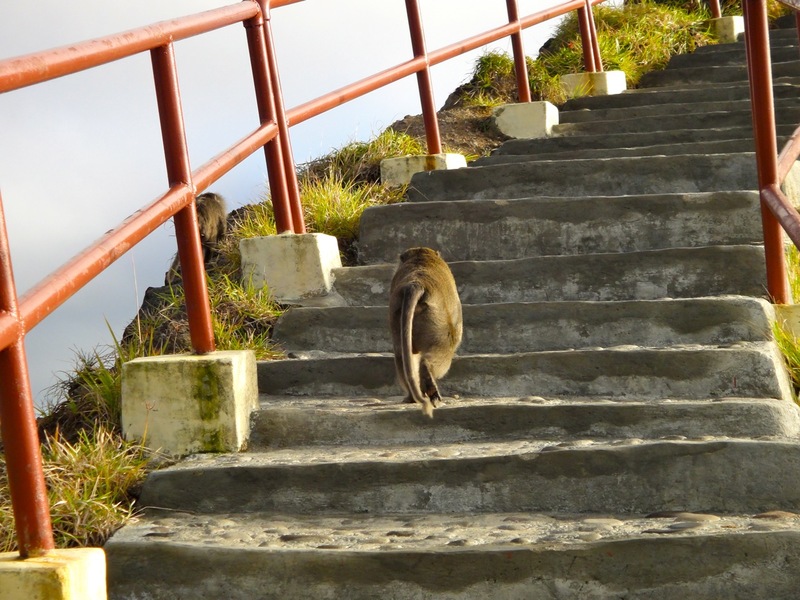 There are steps to the fenced area that is the puncak, or Inspiration Point. 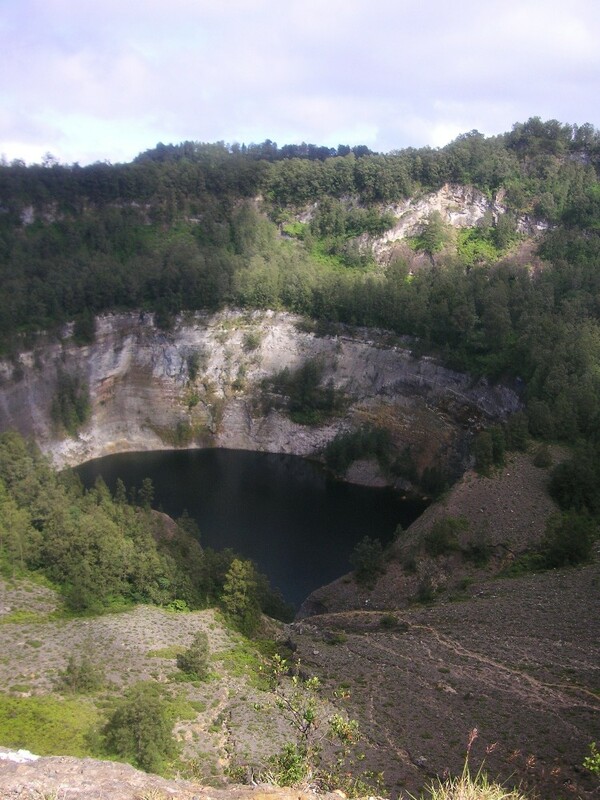 This is not actually the highest point on Kelimutu, but it is the only hiking destination on the mountain – you should not attempt to leave the paths or fenced areas because the steep slopes are dangerous. 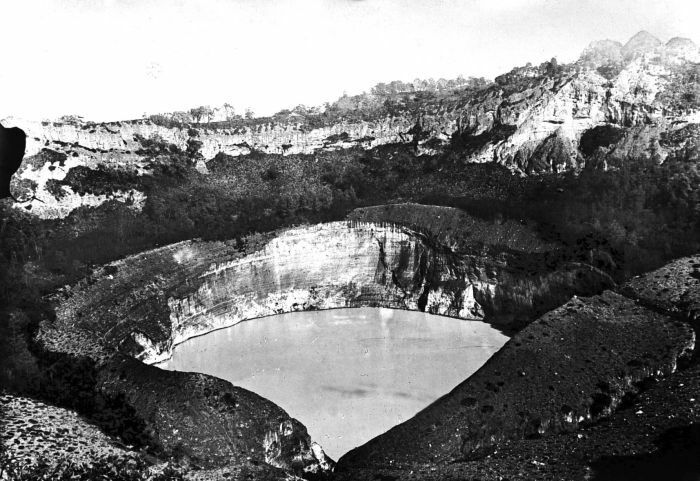 From Inspiration Point you can also see the actual Ribu in the area, which is 12 km to the north of Kelimutu and easily spotted because it has a Telkom mobile phone tower on the top. This Ribu is called Keli Lepembusu and it’s our recommended destination after Kelimutu because you can bag it by motorbike, you can be there and back in less than 2 hours from Moni. 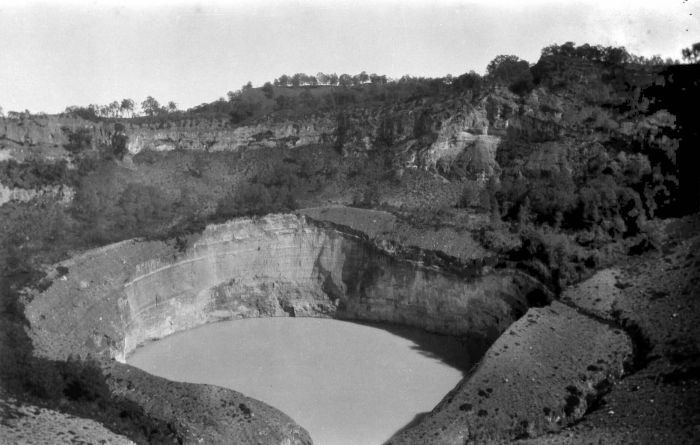 As soon as you’ve had your fill of coloured lakes, return the same way. Whatever you do, don’t follow the Lonely Planet advice of walking down from the carpark. 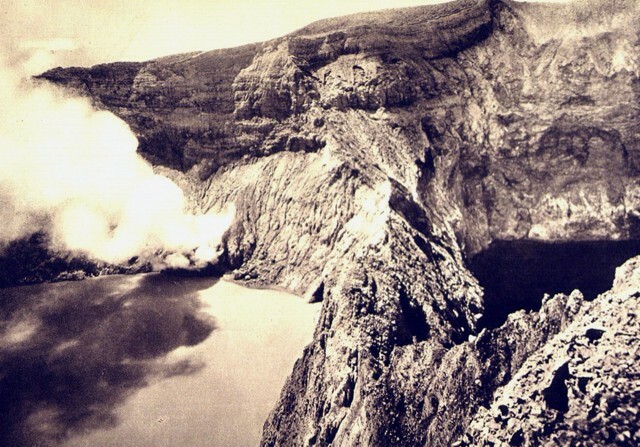 This strikes us of desperation to make Kelimutu more interesting or fill up more of the day than required. If you do decide to do this, get your driver to drop you off at the forestry office (Dephut) which is 1 km down the road from the National Park office. The descent to Moni from Dephut is worthwhile if you haven’t been through many kampung (villages) in Indonesia. However, we recommend having breakfast in Moni and then heading off to bag the Ribu of Keli Lepembusu, where you are bound to meet some locals and get off the usual tourist trail. 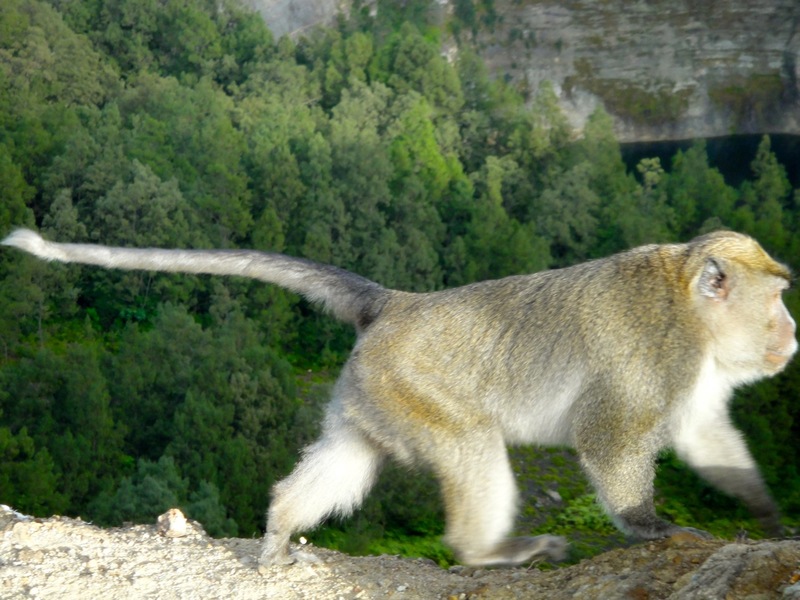 Getting there: You will most likely be travelling across Flores – the turning to Kelimutu National Park is about 5 minutes outside the village of Moni on the way to Ende. It’s about 30 minutes drive up the road to the car park. Accommodation: There are several hotels in the village of Moni. Permits: Foreigners even if resident in Indonesia pay Rp. 150/225,000 (weekday/weekend) entry at the National Park gates, locals pay a fraction of that. Water sources: There are several food stalls at the carpark, and you can buy muddy coffee, tea and ginger tea from some charming old men who do great business at Inspiration Point. We stayed in Moni at the Palm Cottages (150 000 per night for two people, including breakfast). We didn’t do the ‘dawn thing’ instead sauntered up there at about 9am. It was a beautiful clear morning with a couple of local tourists on top and an old lady selling coffee. Look, I’m glad I went and had a look but as others have said, it wasn’t ‘spectacular’. I spoke to the coffee lady and she said that in June/July there can be 200 people at the lookout…glad I missed that. 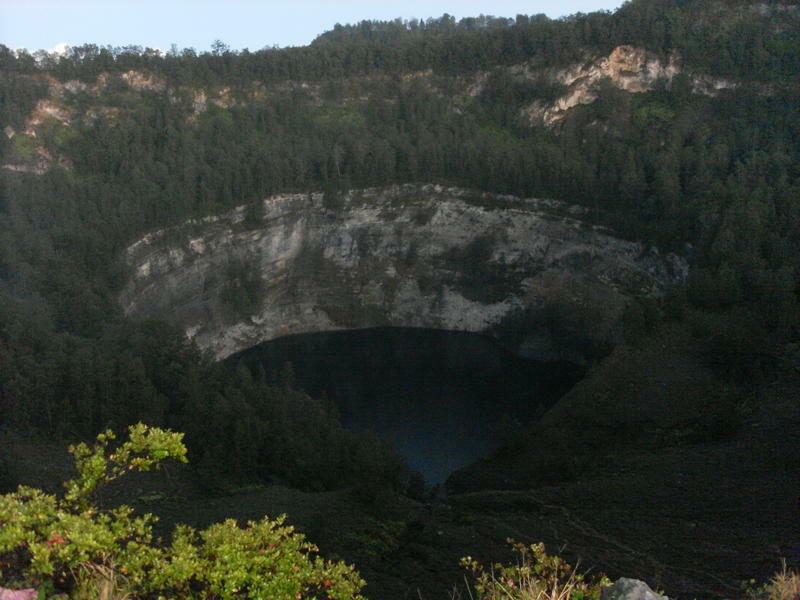 Would I go out of my way to see Kelimutu? Na, probably not. Current fee is 150000rp in weekdays and 225000rp in weekends. I was not interested in paying that, so just woke up early and left Moni by foot at 1am and at the time I reached security gate there was still noone there (near the Rainbow cafe there is a shortcut that firstly passes waterfall and then joins the paved road after some time). I don’t enjoy sneaking in, but Kelimutu is not that great to pay amount they are asking for. It must have been a nice hike before paved road was build, but now – really nothing special. There are ways to improve the hike. After you visit Kelimutu, instead of walking down or driving back on a paved road, just look at opencyclemaps for a path which is south-west from the main road. If you walk back from the top – that path will be on your right side. You can fallow that path (always keep right direction, at one point that path almost reenters main road. You might need gps to find the beggining of the path) and you will have a pleasant hike down to the Moni. That path avoids security gate, so it might be possible to walk up in day time without paying ticket fee too. Would you possibly be able to mark out the route you took by foot from Moni on maps? And if we reach the security gate before 4am can we avoid paying up? 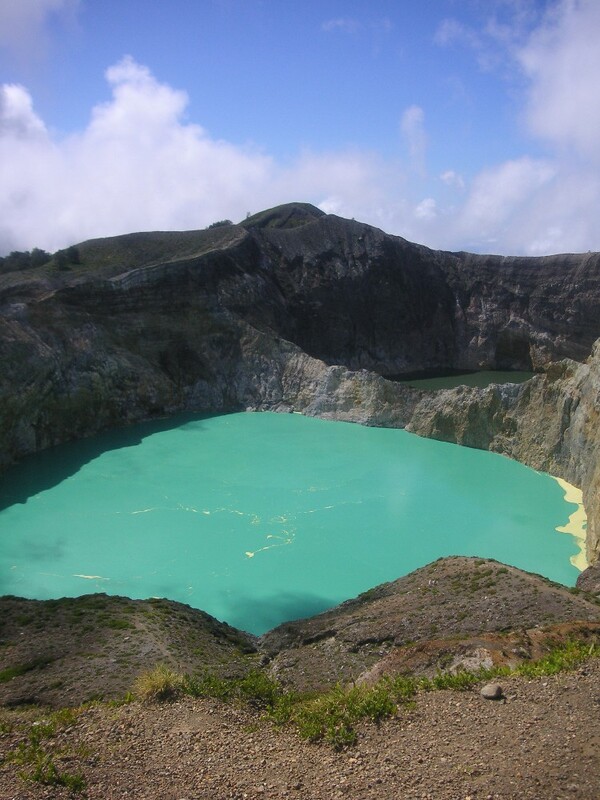 As more and more tourists make it to Flores these days (May 2014), Kelimutu was very crowded in the morning I visited. Some turlocs (Indonesian travellers) were extremely loud and took hundreds of selfies. Also, the guard at the top was extremely rude and unprofessional. The current fees are: 30000 for a foreigner, 3000 for a scooter, 50000 for a photo camera (no charge for your mobile, more for a video camera). Charging a camera fee at a tourist attraction is as ridiculous as it is and it is possible to avoid it. Just went up today. 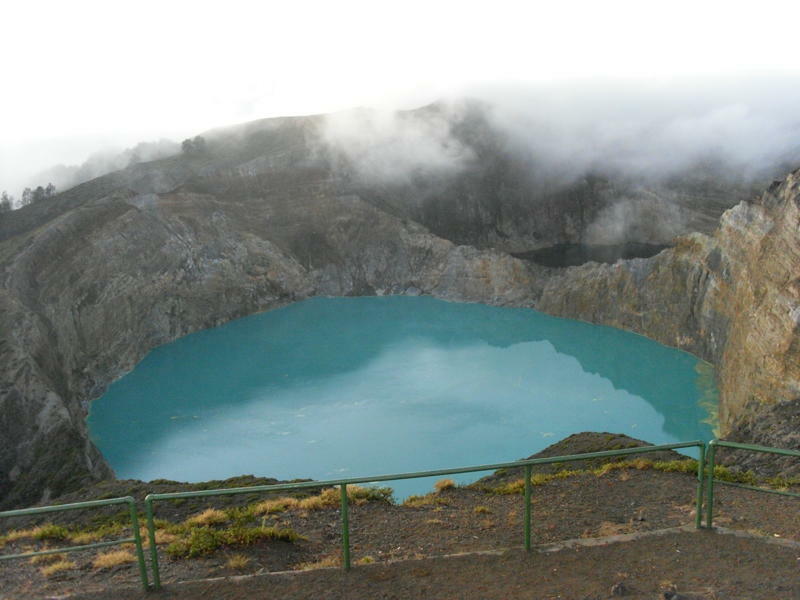 I also agree that Kelimutu is nowhere near as good as the volcanoes on Java, Bali or Lombok. Against the recommendation here, I went off the track up the side of the southern lake. From there I had an alternative view of the 2 turquoise lakes. Certainly dangerous if you go too close to the edge (but less risky I think than climbing way up the mast on Kelilepumbusu)! just got back from a interesting trip with dan. after visiting kelimutu for the second time it is fair to say i was underwhelmed.i feel sorry for people who make the trip to ende solely on seeing kelimutu as their are far more impressive places to see. as dan metions above, iya and egon are more impressive. 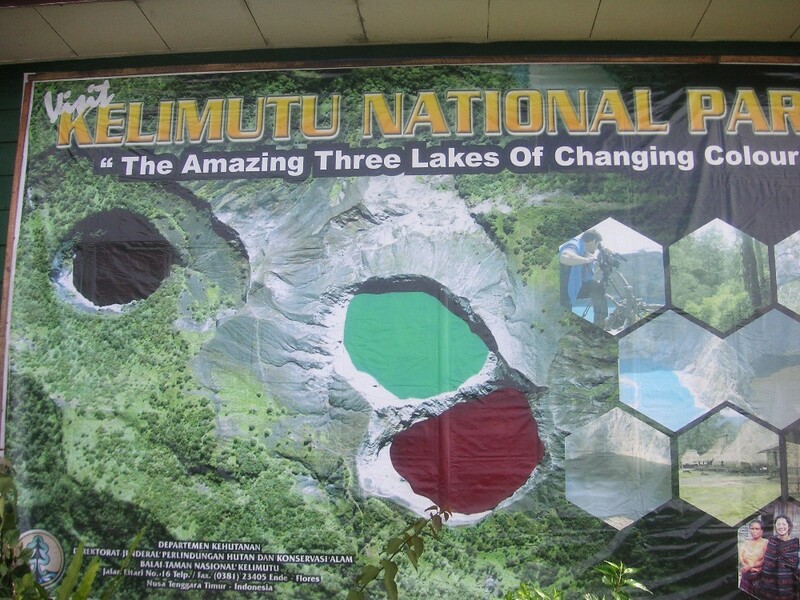 I was a little disappointed with Kelimutu actually. It probably would have been great decades ago when it was wilder. If you build a road and cement path to the top of a natural beauty it kind of takes away from the experience. It’s definitely worth a visit but I agree with Andy that it’s over-rated, especially if you compare it to Iya or even Egon. dans the man to figure out flights.i got lucky when i went to flores.i just showed up at bali domestic airport and they happened to have a flight going to labuanbajo(flores) within the hour. my trip, i started from labuanbajo in the west and finished in lembata in the east and it took around ten days.but i did spend about three days around komodo island area. ( which was great ). but if you dont fancy overgrown lizards then i think it is possible to do most of flores in five days. i would suggest two options. one would be is to go from labuan and finish in maumere or ende depending on flights.you would have enough time to do kelimutu and easliy another ribu. either inierie or ebulobo are both baggable. bajawa is a nice town to hang out. the other option would be is to start in the east like lembata( you can fly there via kupang timor) and work your way back to ende.this part of nusa is my favourite with stunning volcanos.check out ill boleng and lewotolo.you could bag them as well. 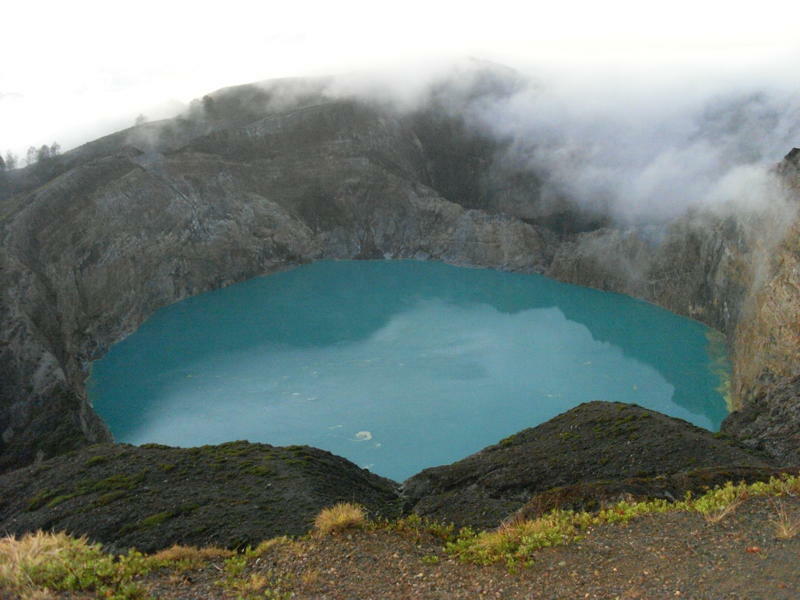 I want to go to Kelimutu in August. But I still don´t know what is the best way to get to Flores. I just heard from Trans Nusa and that they have flights to Ende. But how can I book? Can you recommend a travel agency? 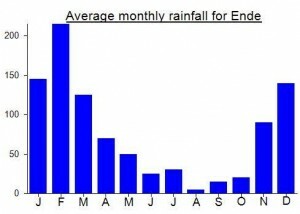 And is it easier to start in Ende or maybe better Maumere? I will have about 5 days for this trip. Would this even be enough for a flores round trip? I’ll be in Flores the first week of August actually. Arranging tickets in advance is a real pain! However, Batavia fly from Denpasar to Maumere and back (usually via Timor I think) and that’s the way we’re coming back. You can book those in advance. For Transnusa, you can only book one month in advance, and even then not online. Merpati is the other option but they don’t exactly have the finest safety record and I’ve heard plenty of reports of flights cancelled if there aren’t enough passengers. So I’d say stick to Transnusa and Batavia. 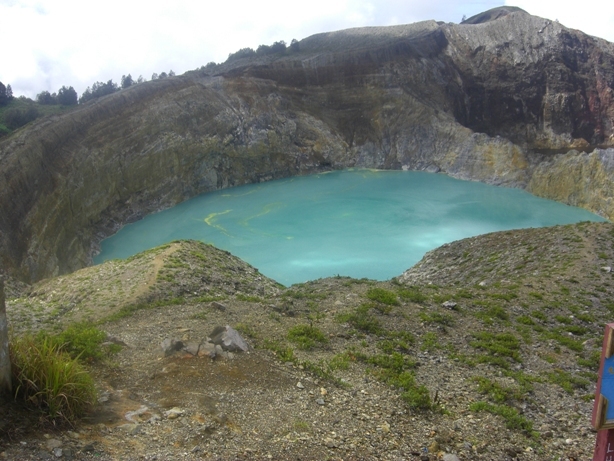 this is a very easy 10 minute hike to the top assuming you get a local to give you a ride to the park entrance.great views of the three lakes but the colours are not what they used to be.but still worth it.if you have come this far into flores i urge you to make the effort to go on the east coast an take a ferry to the island of lembata. crystal clear water and volcanos galore around there.stay at ille ille.theres a dutch guy called jim.he has a more dvds than the whole of thailand put together and has great advice about what to do.